I'm gonna get a little personal with you today! A couple of a weeks ago I shared a story on Snippet & Ink: "How Cheesy Love Letters Rekindled Our Romance". Ever since I was a kid, I would easily get embarrassed, especially with sharing really personal things. (It's a scary thing to put something SO personal out there for all the world to read.) But this year I am challenging myself. I am doing things that make me feel uncomfortable, to not only prove to myself that I can take risks, but to really take FEAR by the handle and not let it consume me. To be honest, I kind of didn't promote this story on Snippet & Ink because I was embarrassed about it. I thought it was going to fail, and so I just closed my eyes and forgot about it. After a couple weeks of avoiding looking at the analytics, it actually did really well. What a surprise! Lots of lessons to learn here. I am not perfect, and I guarantee you that I will be embarrassed and shy about a story again, but the silver lining is that I did it, I shared it, and people actually responded to it. So anyway, if you want a goofy read for the day, check the link in my profile to read all the silly things my hubby wrote for me. They really are super silly, but that's what I love about them. I'm not at all into "mooshy-mooshy romance", so these poems are perfect solution for US and I hope these little notes make you smile! Im not really mad if you eat all the ice cream. Here’s a little note, you really float my boat. You didn’t have your keys for the house, but you’ll always have the key to my heart. With you gone, it’s been pretty boring. I chased you, you got caught. We went to Vegas, there we tied the knot. I wish we were off the clock. We could be at the boardwalk. I wish we could get roller coasted. We would use sunscreen so you don’t get toasted. So I’ll just come out of the blue and say I Love You. Be careful in the sun. I hope you know you’re the one, because without you I am done. They give us warm nights. Went haiku today, love you. When you’re old and gray, I’ll be here to stay. When you use your super power, I’ll never cower. When we’re in bed together, I wish I could be there forever. I wish we could’ve played in the sun. I could be worse, I could’ve been forced to bag. Even though you’re all bed hogs. 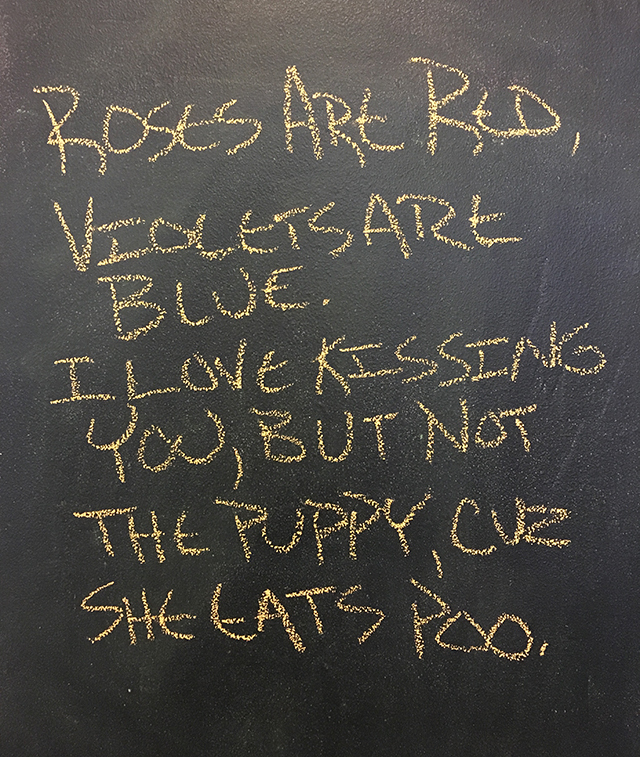 A little poem for you. we know what makes each other tick. That’s what makes us click. Don’t forget your protectors are hairy.